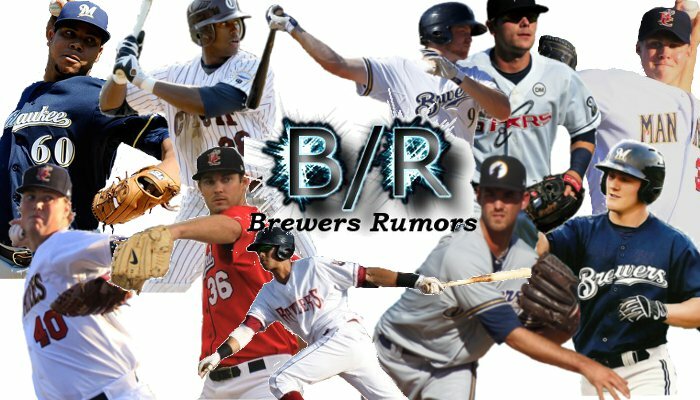 Welcome to Brewers Rumors: A blog created by columnist Alec Dopp — striving to provide the best Brewers content on the web. Breaking news, interviews, opinions, scouting reports — we've got it all (or at least we like to think so). The Brewers’ minor league system has had two seasons to recover from the Zack Greinke trade that severely decimated its young, prospective talent pool. Thankfully, however, the outlook for the system seems promising. With two first-round selections in each of the last two amateur drafts, director of amateur scouting Bruce Seid annexed several promising youngsters who could be solid contributors for the club down the road. If not they may become valuable trade bait for general manager Doug Melvin. Those players not included in the Greinke trade of 2010 have also helped add depth and talent to the system. Jimmy Nelson and Tyler Thornburg, among others, have progressed quite well. Even so, one would be generous to place the Brewers’ system among the most elite in all of baseball, or even in the top half of the National League. The fact still remains that no “top-caliber” prospect has revealed himself…yet. Perhaps 2013 will be the year Milwaukee’s draft-day labors pay off with the manifestation of an elite youngster. Below depicts how I see the Brewers’ system stacking up with February upon us. I’ve also included a prediction for each player for the upcoming season. Let’s get to it. Click here for my 2012 prospect rankings and predictions. 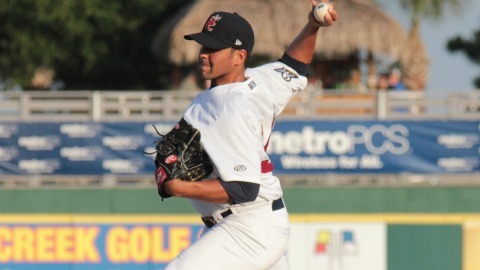 Brief: A standout 2011 campaign between double-A and triple-A ball made Peralta the Brewers’ top pitching prospect for good, but relatively disappointing (4.66 ERA, 1.58 WHIP over 28 starts) 2012 stay in the Pacific Coast League put his big-league future in question. But after putting on a show in his short stint in the big leagues toward the end of last season, Peralta seemed to have regained respect from scouts who once praised his upside as a youngster. His slider has great action and his velocity is legit; the only question is his control. Prediction: Peralta doesn’t make the opening-day rotation; however, he does amass at least five spot-starts by the end of the regular season. Brief: Jungmann’s ludicrous senior campaign at Texas placed a heavy burden of expectation on his shoulders following the 2011 draft, so by comparison his first professional season was farm from scouts’ expectations. A slight decrease in velocity and underwhelming swing-and-miss ability was obvious over his 26 starts in high-A Brevard County. However, I see reason for optimism. He showed an ability to throw each offering in just about any situation, his command remains plus-average and he knows how to induce ground-balls, as evidenced by a splendid 1.94 GO/AO ratio. Throw that all together and I think you’ve got an average No.3 and solid No.4 starter. Prediction: Jungmann starts out in double-A ball and eventually moves his way up to triple-A Nashville by season’s end. Brief: Lurid strikeout rates between low-A and high-A ball in 2011 put Thornburg on the map, punching out a ridiculous 10.5 per nine innings that year. Given his smallish stature, scouts were astonished at the velocity with which he was able to create; his secondary offerings were impressive, too. That production carried over into his jump to double-A ball to start off 2012, where in his first eight starts he allowed just 10 earned runs and struck out 51 batters, enough to warrant a spot-start during inter-league play. Stuff wise, I’m almost convinced he is bullpen bound. His low-90s fastball is incredibly straight and lacks consistency with respect to command and is destroyed when up in the zone; however, his curveball has very nice action and his changeup has come along well. Prediction: Thornburg doesn’t make the opening-day roster, but (despite my intuition about his stuff) eventually carves a niche as Milwaukee’s No. 5 starter by the end of August. Brief: Odds are you won’t see Hellweg this high on many organizational rankings, so allow me to elaborate as to why I have him here: upside, upside, upside — quite possibly no other Brewers prospect has as much of it as the 24-year-old Hellweg. His fastball touches close to triple-digits with little effort and easy arm action and his secondary offerings have no other option but to improve. Furthermore, his massive size (6’9″, 210) portends a future workhorse. Control issues are still an issue, but those are bound to see improvement with further coaching. Prediction: Hellweg starts in double-A but quickly moves up to triple-A, where he makes a legtimate push for time out of Milwaukee’s bullpen at the end of the season. Brief: High on Bruce Seid’s draft board last summer, the Brewers took Coulter 27th overall and got one heck of a first professional season in return. The 19-year-old posted a .302 batting average and .363 average on balls in play with the rookie club in Helena, showing an advanced approach at the dish, though he wasn’t able to tap into his power, amassing only 11 extra-base hits. While he’s still a project as a catcher, all indications are that the coaches like what they see in him from behind the plate. With more coaching, he may live up to the Brian McCann comparisons. Prediction: Coulter flashes his line-drive power potential to the tune of 15 home runs between rookie and low-A ball. 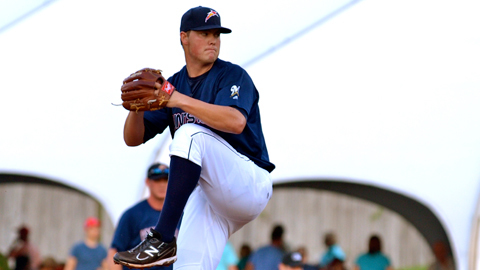 Brief: Big, strong and admittedly competitive on the mound, the 6-foot-6, 240-pound right handed-throwing Nelson pieced together a spectacular stint with high-A Brevard County last season. However, injury and heightened competition slowed him up (though not by too much) in double-A ball. Still, Nelson has legit stuff, with the system’s best sinker and a slider that grades out as plus-average. His ability to generate whiffs with his changeup may determine how effective a starter he will be. Nelson told me earlier in January that he’s set his ceiling high for 2013, aiming to make his debut with the Brewers by the end of the season. Check out our full conversation here. Prediction: Nelson is a standout in spring training and finds his way to triple-A by mid-season. Brief: Morris’ best professional season came in 2012, where he led the double-A Southern League in home runs, runs batted in and wRC (100), and finished in the top five in doubles and batting average. Unfortunately, that production came at the expense of a lack of patience and plate discipline, as he finished near the bottom of the league in BB/K (0.34) and fielded criticism from scouts for having too many holes in his swing. Still, Morris is without question the top first-base prospect in the system, and with a strong spring training and start to his 2013 campaign, he may push for playing time should Mat Gamel falter once more. Prediction: Morris starts the year triple-A and continues to pound the ball at an impressive rate. Roache has been rehabbing all offseason in preparation for 2013. He told me in late December that his arm is “feeling well” and that he’s not sure where he will start off 2013. Prediction: Roache starts out in low-A Appleton and works his way up to high-A Brevard County by season’s end. Brief: Gennett has been a fan-favorite since his 2010 rookie season not only for his unique name but for his productivity at the plate. The 22-year-old has a career .300/.339/.416 slash line as a professional and has been a singles and doubles machine each year. He doesn’t have much raw power, but he’s shown to pound the gaps with consistency, especially against right-handed pitchers, as evidenced by his .405 slugging percentage versus such pitchers last season. He still has room to improve with his defensive consistency, even with his above-average range (he was a shortstop in high school) at second-base. He won’t be much of a base-stealer at the next level, but he’s an intelligent base-runner that may be of great use to manager Ron Roenicke down the road. Prediction: Gennett starts in triple-A Nashville and stays the entire season. Brief: The Brewers took a calculated risk when they took Taylor with their second-round selection last summer, as Taylor had been a Cal State Fullerton commit with a football background. That risk payed off in a big way, as the athletic former high school football standout produced a .435 batting average on balls in play and 1.100 OPS between the club’s two rookie-level clubs in just his first professional season. Evaluating a player based off 83 total plate appearances is far from just. However, scouts seem to believe Taylor has an incredibly high ceiling. A knack for putting solid contact on the ball, impressive defensive range and palpable base-running skills, this 19-year-old is a youngster to keep an eye on. Prediction: Taylor comes back down to earth once he reaches low-A Appleton. Brief: Probably the least well-known piece to last summer’s Greinke trade, Pena is difficult to evaluate and project for several reasons. Though he has tremendous raw stuff, with a fastball regularly touching the mid-90s and changeup worthy of high praise, and great physical and athletic ability at 6-foot-3, 190 pounds, his lack of control has toubled scouts. In seven starts with double-A Huntsville last season, the young 23-year-old walked 23 batters in just 32.1 innings, which offset his tremendous swing-and-miss capabilities. Improvement in that area could give him a back-end rotation opportunity; regression could lead to a long stay in the minors. Prediction: Pena starts off in double-A Huntsville and sees improvement with his control, eventually leading to a call-up to triple-A by August. Brief: Bradley’s inaugural season in the system got off to a scorching start, allowing zero earned runs to cross home over his first 19 innings of work. Then, May rolled around and it wasn’t until late June that he put together a respectable outing. It was a disheartening campaign for the touted southpaw, to be sure. One of the big things that plagued Bradley in 2012 was his inconsistencies around the strike-zone. At Georgia Tech, he pounded the zone and generated swings-and-misses from start to start, therefore having confidence in his stuff on a regular basis. In the Florida State league, hitters capitalized off his lack of command and weren’t fooled by his late-breaking action. Bradley is without question the top southpaw in this system, but it will be crucial for him to improve his control and, more importantly, become more confident in each of his offerings. Prediction: Bradley returns to high-A ball and moves up to double-A by the end of 2013. Brief: Baseball America caught many folks off-guard when they placed Haniger in its top 10 prospect rankings a few days ago, but I wasn’t surprised. I had the opportunity to scout Milwaukee’s 2012 supplemental first-round selection last summer in low-A Appleton, and I can tell you that this is the type of kid Roenicke would love to have on his roster. Strong, accurate arm; good range in the outfield; intelligent base-runner who can also steal a few bases here and there; puts solid contact on the ball; still improving with pitch recognition. It will be interesting to compare his game from 2012 to this coming season. Prediction: Haniger returns to low-A ball and quickly proves to be ready for a call-up to high-A by August. Brief: Burgos was the fastest-riser in the system last season, moving up to triple-A ball by season’s end after starting in high-A Brevard County. Consequently, the 25-year-old heightened his reputation with scouts and casual fans each step of the way. For me, the biggest determining factor in whether he can push for a late rotation spot will be if he can continue to generate ground balls and hold batters in check. Last season, Burgos posted a ground-ball rate of 42.4 percent and held batters to a .265 BABIP, though he hit a rough patch against tougher Pacific Coast League competition late last season. Control, command and offerings seem to be in place; it’s his ability to help out the defense with ground balls that will be critical moving forward. Prediction: Burgos picks up where he left off in triple-A Nashville, earning a September call-up with a spot start by season’s end. Brief: Being drafted after the likes of Jungmann and Bradley in 2011, Gagnon has proved to be yet another solid find for Seid and company. The Cal State Long Beach product last season started 25 games between the low and high-A levels and was productive at both. He wasn’t and probably never will be a strikeout hoarder, as he lacks one true swing-and-miss pitch to his repertoire. However, his command has been stellar and hitters simply haven’t figured him out just yet — as evidenced by a .264 BABIP last season. He’ll turn 23 years old in June. Prediction: Gagnon returns to high-A ball to start 2013 and remains there for the entire season. Brief: Scouts have had the scoop on Rivera since his rookie 2010 season, where he put up a .209/.243/.257 slash line with a ludicrous 5.04 range factor at the rookie level: a plus defender with a well below average approach at the plate. While there is some merit to that widespread sentiment, I don’t believe it is completely indicative of the type of player Rivera might one day become. Yes, it is true that Rivera has struggled with pitch precognition and his plate discipline is far from big-league ready. However, posting a career-low in strikeout rate (23.5 percent) and career-high in walk rate (5.1 percent) is reason for optimism. Add that to what I’ve seen to be very nice raw power, hastened bat speed and tremendous range and feel for the shortstop position, and I think 2013 could be a breakout season for the young Puerto Rico native. 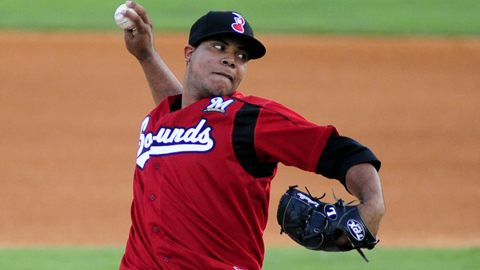 Prediction: Rivera lights up Midwest League pitching and finds himself in high-A Brevard County by season’s end. Brief: With just one pro season to his resume, Mcfarland has flown relatively under the radar for his brief stay in the system, which is surprising given his outstanding production at the rookie level last season. The 20-year-old showed a solid approach at the plate and a knack for getting hits (as evidenced by a superb .397 BABIP) whenever he makes contact. One scout described Mcfarland as being “athletic, great hands with glove and bat, quick release, puts ball in play, runs like hell.” If he continues to garner such respect while putting up big numbers across the board, he’ll have a change to hasten quickly through the system. Prediction: McFarland witnesses slight regression at low-A Appleton, but nonetheless remains one of the most intriguing of Milwaukee’s prospects. It was undoubtedly a year worth looking back on with exuberance for the Milwaukee Brewers’ farm system. Coming into the season, you would have been hard-pressed to find the Brewers’ collective system placed above of the bottom-five overall in many organizational rankings among big-league ball clubs. Baseball America and Baseball Prospectus followed that trend, with BA ranking Milwaukee at No. 26 overall prior to the season and BP placing Milwaukee at an even worse No. 28 overall. This shouldn’t come as much of a surprise to anyone with a fundamental knowledge of the Brewers’ minor-league talent, of course. The Zack Greinke trade of two winters ago left the talent-pool excessively thin, consequently leaving 23-year-old right-handed pitcher Wily Peralta with the proverbial “top prospect” moniker prior to the season after a tremendous 2011 campaign. 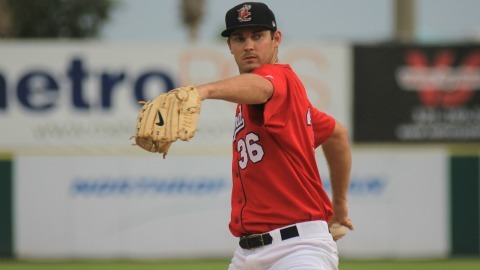 First-round picks from 2011 Taylor Jungmann and Jed Bradley were also seen as guys who could take home top-prospect honors after the season, as well as right-hander Tyler Thornburg. After that, there weren’t many youngsters who looked to be of any relevance anytime soon at the big-league level. However, after a fruitful 2012 draft class and the trade that made Greinke a Halo, subsequently giving Milwaukee three intriguing prospects to add to the system, things are looking up and fans can now expect a steady influx of talent to the big-league roster as early as the start of next season. So with the season essentially over, it seems fitting for me to update my end-of-season top-25 prospect rankings. To see my preseason rankings, click here and to see my mid-season rankings, click here. 1. Wily Peralta, RHP — Walks have been up due to control regressions and will need to show more refined control of his heavy fastball. However, pure swing-and-miss ability is certainly there; his slider has great diving action and will be a definite asset down the road. Have no doubt he’ll show signs of potential out of the ‘pen this month and with a good spring training should be the No. 5 starter come April. 2. Taylor Jungmann, RHP — Has been anything but the strikeout hoarder he was in college but has absolutely looked the part of a top prospect in every other aspect. Is always around the plate and hits his spots consistently; knows how to set-up hitters with his secondary offerings and hardly ever gives up the long-ball. A good looking prospect in my book. 3. Tyler Thornburg, RHP — Milwaukee’s prospect darling has been outstanding by all accounts in 2012; the raw statistics are there to support his case to be in the rotation come next April. Still, I have concerns; namely with his pure stuff. His fastball gets crushed when over the plate, is way to reliant on the pitch and furthermore doesn’t induce a lot of ground-balls. His curveball — though having nice movement — is much too inconsistent control-wise. Add on that he still hasn’t developed a good feel for his changeup and his lack of stamina, and, yes, I have my doubts. Will be a reliever when all said and done. 4. Jimmy Nelson, RHP — Got off to a scorching start in high-A but ran into troubles — and shoulder fatigue — upon being promoted to double-A midway through the season. One of my favorite prospects in the system; massive yet prototype 6’6″, 245 build makes him highly durable. Good three-pitch mix with a promising sinker and plus-average slider that’s already MLB ready. The ability to control his fastball will be the key moving forward. Could push for a spot start by the end of next season. 5. Logan Schafer, OF — Knocking on the major-league door for a while now, Schafer should get at least minimal playing time in September. Impress, and he will certainly challenge Carlos Gomez for the starting job in center field next season. Disappoint, and who knows what happens. 6. Hunter Morris, 1B — The lack of a quality approach at the plate dampened his otherwise impressive power numbers from 2010 to 2011, nearly to the point where scouts questioned his ability to grow into a serviceable bat in the bigs. But while his strikeout rate remains somewhat high, he is drawing more walks and is developing a more refined approach. Further improvement in that area could mean he is starts for Milwaukee at first base in 2014. 7. Clint Coulter, C/DH — Milwaukee’s 2012 first-round pick has struggled behind the plate but has thrived at it. With 22 passed balls in just 25 games, catching may not be where he best projects at the next level; maybe a first base or third base. However, his impressive eye at the plate — as evidenced by his .429 OBP — is a great sign for the organization. 8. Jed Bradley, LHP — It was a season filled with disappointment and injury for the 22-year-old southpaw. Missed a stretch of time due to a groin strain and has not pitched since August 8 due to arm soreness. Still believe the stuff is there to be a future No. 3, but will need to refine his command before he becomes what scouts project him to be. 9. Johnny Hellweg, RHP — Second piece received in the Greinke deal, Hellweg stands in at a healthy 6’9″, 205 pounds. Has very good raw stuff including a mid-90s fastball that induces ground balls. Doesn’t have much control over his secondary offerings and has walked nearly as many as he’s struck out in his short stint in the system. I believe he would be an excellent late-inning reliever down the road. 10. Khris Davis, OF — Scouts aren’t high on his toolset but his statistics are tough to ignore. Slugged his way to a .383/.484/.641 line in 44 double-A games and got the call to Nashville, where he ran into troubles but is still boasting a nice 119 wRC+ through roughly 30 games. Not entirely sure he has a position to play on the big-league roster; may ultimately wind up as trade bait. 11. Ariel Pena, RHP — The final piece in the Greinke trade, Pena also has the stuff to suggest he could be a backline starter in the bigs. His devastating changeup gets hitters off his fastball, but lacks a quality breaking pitch. Doesn’t induce a lot of ground-balls and control issues are troubling. A strong spring training could put him on an early call-up list next season. 12. Scooter Gennett, 2B — Has thrived off his ability to hit for singles and pound the outfield gaps with well below-average power. Pushing to hit over .300 for his third consecutive season. Sees the ball well and has good knowledge of the strikezone, still developing as a defensive second-baseman. His diminutive 5’9″, 185 pound frame still concerns scouts. 13. Victor Roache, OF — Selected with their second first-round pick this past June, Roache’s broken right wrist suffered during his final year at Georgia Southern has kept him from playing time this summer, as he’s rehabbed in Arizona in preparation for fall and winter instructional leagues. Athletic build with a ton of pop in his bat, could end up as a corner outfielder. 14. Hiram Burgos, RHP — Started in high-A and moved all the way up to triple-A, where his stuff has stacked up well against the competition. Won’t blow batters away but shows a good feel for each of his pitches. Much more of a fly-ball pitcher than a ground-out pitcher. Will have the chance to be on the opening day roster with a strong 2013 preseason. 15. Caleb Gindl, OF — The stocky 5’9″ outfielder has been waiting to burst onto the big league scene for two seasons now and should get the call this September as a depth-adding corner arm. Got off to an abysmally slow start but has since found his stroke; put up a .319/.370/.527 line in July and furthermore managed to raise his slugging percentage up to a respectable .429. Unfortunately, there doesn’t look to be anywhere on the roster for him to play next season. 16. Kentrail Davis, OF — I’ve always loved Davis’ tools; is extremely athletic with plus-speed on the bases and in the outfield. His bat has been in question for his entire playing career, but has shown great signs of improvement this season. Displaying good discipline at the plate and improved power during his stay in double-A this season. 17. Drew Gagnon, RHP — The Brewers’ fourth-round pick in the 2011 draft has produced well above what many had anticipated to this juncture of his career. 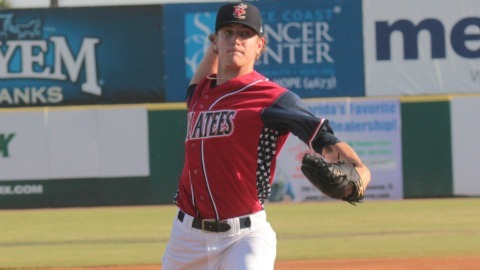 Posted a very nice 2.83 ERA over six starts with low-A Appleton and got the call to Brevard County this summer. While he’s struggled to produce ground outs consistently, his credible fastball-curve-changeup repertoire has worked splendidly against the competition. Could turn out to be a future No. 5 in a best-case scenario. 18. Jorge Lopez, RHP — A youngster who still has a ways before he fills out physically, Lopez has racked up the strikeouts during his second season in the system but at the same has struggled to control his fastball-curve-changeup mix. Scouts love his overall upside and its tough to disagree. Could become a mid-rotation arm in at his very best — a middle-inning reliever at his very worst. 19. Mitch Haniger, OF — Found immediate success in low-A Appleton after becoming the Brewers’ third and final first-round pick in last June’s draft, however an untimely PCL tear ended his rookie stint. Has a very well-rounded game without any noticeable weakness. Has gap power to all fields; solid defender with plus-arm, good work ethic and makeup. Really like his game. Will be interesting to see how his bounces back from injury next season. 20. 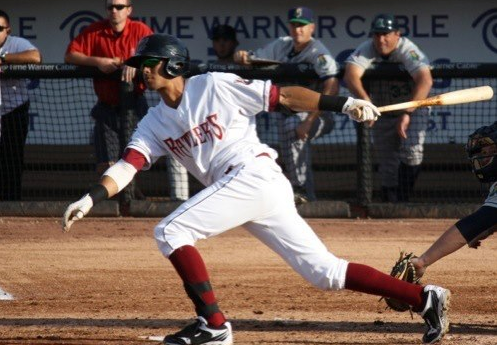 Yadiel Rivera, SS — A defensive whiz at shortstop, no one will argue that his glove doesn’t project to be plus-average at the next level — his bat, however, is an entirely different story. Still learning to repeat his mechanics and overall plate discipline, Rivera’s hit tool still remains in question. The good part is that time is on his side; at just 20 years old, he should finish next season in high-A and with improvements there could skyrocket to the upper minors. Definitely a name worth watching next season. 21. Tyrone Taylor, OF — Exceeded expectations in rookie ball after being taken in the second round of last June’s draft, especially with his bat; posted a .387/.434/.667 line in 83 trips to the plate this season before injury sidelined him on July 22. His bat will need some mechanical tune-ups as he continues to move up the ladder. Could be a lethal base-stealer down the road. 22. David Goforth, RHP — The Mississippi State product blew past hitters in rookie ball last season out of the bullpen, striking out over a batter per inning. This season, that has been anything but the same in low-A ball — strictly as a starter, Goforth punched out a very average 5.7 batters per nine innings over 27 starts. I’m not too high on his overall arsenal of pitches but his slider certainly looks the part of a big-league swing-and-miss pitch. 23. Jose Pena, OF — After two full seasons in the Dominican Summer League, the raw 19-year-old earned a promotion to Helena after putting up a scintillating .877 OPS in the rookie Arizona League. He now boasts a .309/.316/.582 line in 57 plate appearances and looks like a very intriguing youngster in the system. 24. Eric Farris, 2B — The once highly-touted second baseman began his 2012 campaign ridiculously slow at the plate but he’s recovered to boast a very nice .286/.328/.378 line. His haste on the bases has been far from what it was during his early days in the organization but still nabbed 33 bases in 129 games. Nevertheless, would be a nice depth-providing roster addition this September. 25. Nick Ramirez, 1B — A defensively cumbersome first-baseman with plus raw power at the dish, Ramirez has witnessed massive declines in his offensive production this season juxtaposed to his rookie 2011 campaign, most notably with respect to his plate discipline. A great fastball hitter, the Cal State Fullerton product just can’t seem to stay on breaking offerings and that has in turn led to a strikeout rate of 34 percent this season. His capacity to become a more disciplined hitter will determine his big-league ceiling. Taken in the 18th round of the 2011 draft out of Lufkin (TX.) High School as a groomed middle-infield defender, McFarland made a permanent transition to second base this season — his rookie season — and has flourished. His above-average athleticism enabled him to post a range factor of 4.36 and turn 37 double plays in just 59 games with the rookie club in Helena, though he certainly won’t be limited to that position moving forward. He showed scouts during his high school days that he is a very capable outfielder with a strong arm and quick release to stick at nearly any position on the diamond. Offensively, McFarland has also impressed. A quick bat that produces natural gap-power to all fields has allowed him to post a .299/.355/.420 line over 292 plate appearances this season to go with a .398 BABIP and .354 wOBA. Like many raw youngsters, though, McFarland struggles somewhat to repeat his mechanics and remained disciplined on off-speed and breaking offerings, as evidenced by a concerning 0.28 BB/K ratio. Given his impressive showing this season in rookie ball, I would be shocked to see him remain there next season. It looks like he’s ready to move up to low-A Appleton. 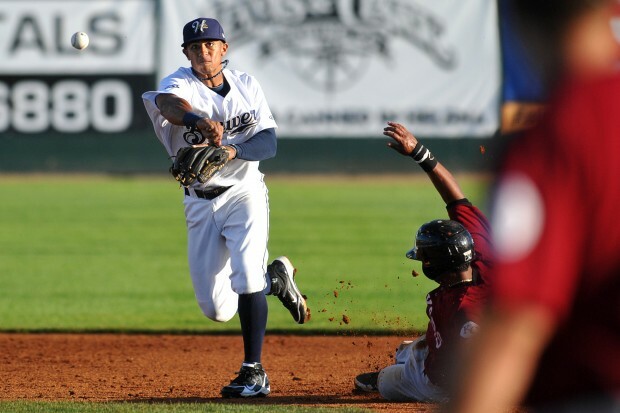 Just days following the Zack Greinke trade, the Brewers made yet another roster splash when it was announced they had recalled 22-year-old and newly acquired shortstop Jean Segura from double-A Huntsville to take over the starting job at shortstop on Monday night. Segura, the centerpiece to the aforementioned trade, held a stifling .433/.500/.533 line in his first eight games with the organization and apparently received a vote of confidence from management having been recalled to the big-league roster just days after being dealt. The transaction may have seemed a bit abrupt to some, but it should come as no surprise to most that the Brewers are in somewhat of a rush to indoctrinate many of their top prospects to the big-leagues. General manager Doug Melvin and owner Mark Attanasio remain staunch in their believe that Milwaukee will have the pieces necessary to compete for a division title in 2013, and its tough to argue with that notion when you consider the fact that A.) The Brewers have witnessed significant improvements down on the farm this season, B.) They [should] be at full health by the start of next season and also that C.) Rickie Weeks’ god-awful offensive yield this season can’t possibly replicate itself over 162 or some odd games next season. In all seriousness, though, there should be no reason to believe Milwaukee won’t have those essential pieces to make a run at the playoffs next season. However, as this season begins to wind down, there are a few things that have yet to be checked off the “to-do” list, and it all begins on September 1 when rosters expand from 25 to 40. Making mince meat of double-A Southern League hitters in the first half of the season, Thornburg became the darling of Brewers fans everywhere when he made his first big-league start on June 19. Since then, he’s seen limited time, making just one other start to go with three separate relief appearances for Ron Roenicke. Consequently, management demoted back to triple-A Nashville on July 30 for him to regain his rhythm as a starter, and he’s performed well ever since. In a system that’s been yearning for a young player to step up and fill at the very least a somewhat important role this season, Thornburg has made his name known. For that reason, you can wager your mortgage that he’ll be on the 40-man September roster. Command issues plagued the early stages of what looked to be his final season in the minors, but after making his big-league debut in late April, he’s come around quite nicely. This past month, Peralta, 23, posted a 2.78 ERA and 1.31 WHIP over six starts, held batters to a .275 batting average and struck out over a batter per inning. His first August start was one to forget (3.2 IP, 5 ER, 6 BB, 6 K), but his swing-and miss stuff that has made him Milwaukee’s top hurler on the farm still remains. With such a blatant shortage of arms out of the bullpen, it’s tough to imagine a scenario where Peralta isn’t on the 40-man roster come September; the Brewers have questions to answer regarding their starting-five next season, and they’ll need to determine if he’s the mid-to-backline starter scouts project him becoming in the near future. My top-rated Brewers position prospect when the season started, Schafer’s entire 2012 campaign has been spent in triple-A Nashville where he’s strove to return to the big-league roster as he did last September. But after a strong spring training, Schafer struggled to hit the ball where defenders were not, resulting in an uncharacteristically low .266 average between April and May. Schafer regathered himself to hit a scintillating .354/.385/.521 in June but was equally as abhorrent in July where he posted an on-base percentage of .197 — yes, 1.97. To make matters worse, Schafer was placed on the 7-day disabled list on July 30 where he was reported to have a sore left knee and hasn’t suited up since. Seen as a player with a chance to see legitimate playing time in 2013, things just haven’t gone Schafer’s way this season and his odds of making the 40-man roster next month have consequently taken a beating. I still think there’s a very good chance he’s recalled, as Roenicke could use his base-running prowess on a few occasions, but not to the extent of which we all previously thought. Receiving a decent amount of playing time after his recall from triple-A in early May, Green’s offensive output just wasn’t up to snuff and he was demoted back to Nashville early on in July, where the Brewers hoped he’d return to his slugging ways just in case Aramis Ramirez was dealt (it didn’t happen) at the trade deadline. Unfortunately, Green hasn’t been able to tap into his power stroke, garnering just a .372 slugging percentage between July and August. He’s still a serviceable defender at third but all signs point to Ramirez sticking there for the remainder of the season as his own statistics continue to climb. Expect Green on the 40-man roster but as a pinch-hitter/runner almost exclusively. Coming off one heck of a 2011 season in triple-A where he hit .307/.390/.472 with a .357 BABIP, Gindl too seemed on the cusp of getting some real playing time by the beginning of 2013. A disciplined hitter with a very good approach at the plate, the stocky outfielder impressed Ron Roenicke this past spring. Since then, he’s been anything but impressive (at least up to his standards). With a career-worst .246/.302/.392 line to go with a heightened amount of strikeouts and diminished walks, Gindl’s big-league future has been put in serious doubt and his odds at making the 40-man roster have also taken a blow. The Brewers are and will be heavy in outfielders, so there’s a slim chance he gets any substantial playing time should he make the September roster. Right now I’d say he has a 50/50 shot at making it. Johnny Hellweg, RHP — A bit of a stretch considering he’s still in double-A ball, but its tough to ignore a guy who throws upwards of 100 MPH and has future strikeout machine written all over him. Will need to work on control issues but some big-league experience next month would do him wonders. Jeff Bianchi, SS — Despite Segura and Cody Ransom already on the roster, the Brewers simply cannot get enough infield help so they might as well consider promoting him next month. Tim Dillard, RHP — I don’t necessarily care for his stuff, but he can be good. Hiram Burgos, RHP — The starting rotation is in disarray anyways, so why not try out one of Milwaukee’s top pitcher-of-the-year candidates a few times? 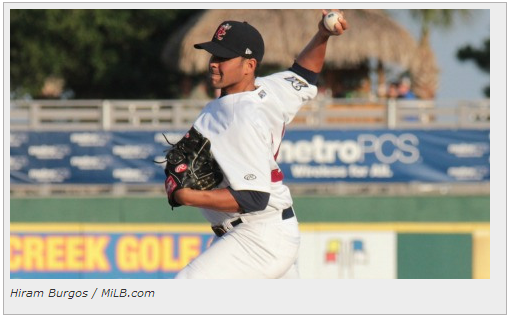 Fautino De Los Santos, RHP — Melvin might as well see what he got in return for Kottaras. Mitch Stetter, LHP — Why not recall a southpaw reliever? Edwin Maysonet, SS — Is it possible to have too many shortstops on this roster? There is a limit, but it has yet to be reached even with Maysonet. Eric Farris, 2B — Elite speed could be utilized on the bases and, hey, maybe he shows he can hit at a mediocre level after all. 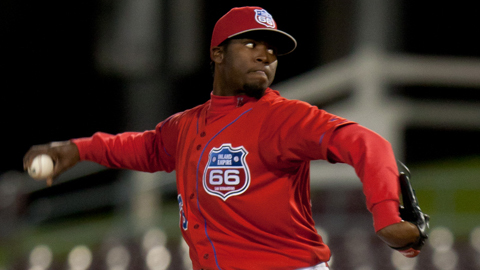 Ariel Pena, RHP — Like Hellweg, Pena has back-line starter material and has performed well thus far in double-A. Might as well see how he fairs against big-league hitting, right?